We are doing a group order this month with Butterfly Express essential oils. Butterfly Express is a great company that sells top of the line oils but they are not a direct sales company so the cost is a lot lower than their competitors. We have been using their products for a few years now and have loved them and use them daily! This group order is for their 72 hour kit. This kit comes in the Small Bag. 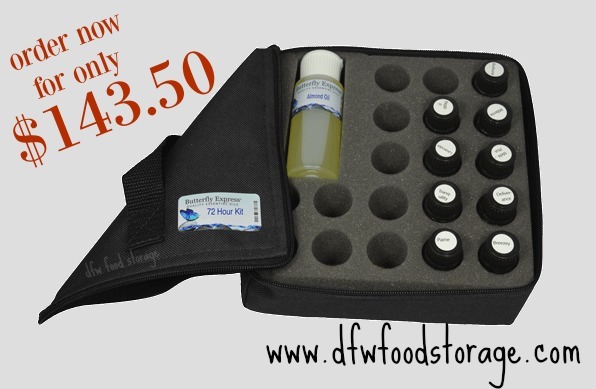 This bag will hold 19 bottles of oil so you can fill it up with some of your other favorite oils. It comes in 4 colors, you can pick black, blue, red or burgundy. Full price it is $179.38. Ok so you might be thinking that seems like a lot of money...but keep in mind these come in 10ml bottles where most EO companies sell theirs in 5ml so you are getting double to amount of stuff and it is still cheaper than most and when you buy it through this group order you are getting an even better deal! Lets talk about what comes in the kit. You get 7 unique blends and 2 single oils. I'm going to touch on the last one really quickly. The Yarrow Blue is a very powerful oil that can be extremely helpful in an emergency situation. I have looked around and everywhere else, this stuff is EXPENSIVE like $50+ for 10ml of it! Crazy huh! Remember that not all brands are created equal and there are some diluted or synthetic products out there. Butterfly Express is a very reputable company and their oils are top of the line. Here is a brief explanation of the oils that come in the kit, for a full break down of what the oils are and how to use them visit this link. Breezey opens bronchial and sinus passages very effectively and has been successful in alleviating snoring, asthma and other allergy symptoms. Deliverance is one of the most potent antiviral, antibacterial, antifungal combinations available. MelaPlus is strongly antiseptic. It prevents the growth of bacteria, fungus, and other infectious agents, also helps with insect bites and stings. Millenia helps with balancing fluid in your body, to brush your teeth may keep your teeth aligned and prevent cavities and many other things. Tranquility can be useful for circulatory problems to the extremities. Stress takes a high toll on the vitamin and mineral levels of the body, especially the levels of calcium. Lavender can be used for nearly all skin conditions. It can be applied to cuts, sunburns, burns, rashes, dermatitis, eczema, and insect bites. Consistent use of lavender with burns and injuries minimizes scarring (just to name a few things).